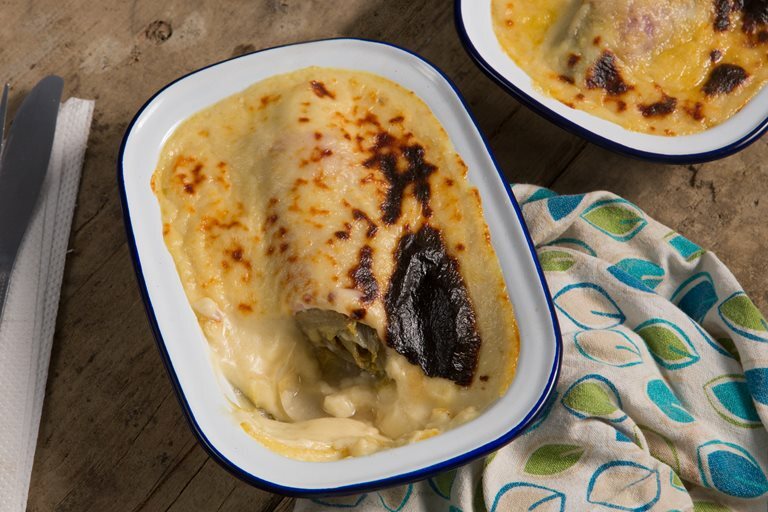 Ham au gratin is a Belgian classic and a personal favourite of Regula Ysewijn. She shares her recipe that's ideal for cold evenings. 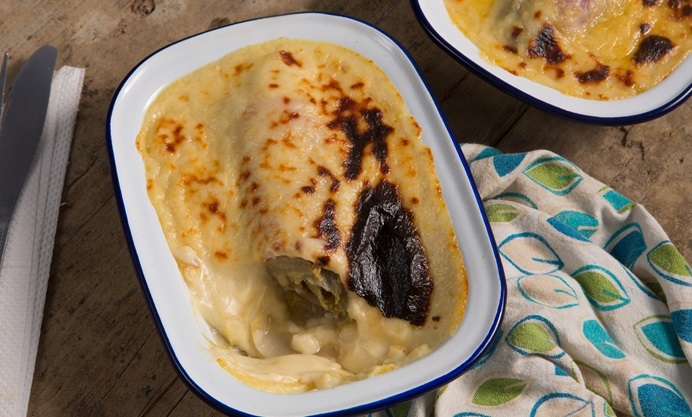 So settle down, make yourself comfortable on the sofa and enjoy this warming dish. Chicory is called 'Witloof' in Flemish and Chicon by the French nationals, it is grown underground, protected from sunlight in order to prevent the leaves from turning green. The chicory is kept just below the soil surface as it grows, only showing the tip of the leaves. It used to be very bitter and children were therefore not very keen on eating it. The last few decades chicory isn't very bitter anymore, due to new growing techniques using hydro beds, they managed to tone down the bitterness. The last four years however there's been a revival for open ground chicory cultivation as food lovers are on the lookout for the bitter taste they remember from their childhood. Once loathed, now loved. Legend goes that blanched chicory was accidentally discovered in a town near Brussels in the 1830s during the war with Holland. A farmer tried to hide his Root chicory by covering it by sand, after a few weeks he discovered that from the roots a small head of cream-coloured leaves had grown. He started selling the leaves and called them 'Witloof' which means 'white leafage'. If you are making a roux which is the base of a white sauce you need to know one thing: flour and butter is 1 to 1 ratio. I always make a large quantity and store in an airtight container in the fridge for when I need it. If you want to do this you just make the dry base which is the flour and butter together, let it cool before you put it into a container. When you want to use it you need to warm the milk, when you are using the roux straight away you need your milk to be cold. So the rule is: warm dry paste = cold milk - cold paste = warm milk. When you've added the milk to the dry paste, you need to cook it until the taste of flour is completely gone. Serve with a Belgian blonde Triple or a good British hoppy beer. If you prefer wine, go for a dry white Soave or a splendid dry English wine. Food photographer, graphic designer and author of Pride and Pudding (Murdoch 2016).